Find articles and videos with Australia and New Zealand cruise tips to help you prepare for the adventure of a lifetime. Learn about the exotic ports and variety of cultures that you’ll encounter on your Australia and New Zealand cruise. Step into this melting pot and uncover the natural beauty that’s hidden in plain sight. In 2019-20 visit iconic landmarks in Australia, strikingly diverse landscapes in New Zealand, and the palm-fringed islands of the South Pacific. In 2019-20 Princess Cruises will be sailing to some of the most fascinating places in Australia, New Zealand and the South Pacific. Explore this wondrous place with this drone video showcasing a relaxing vacation with Princess Cruises. Witness the majestic beauty of New Zealand on Fiordland National Park cruise excursions. Nothing offers nature & wildlife lovers as many chances to explore the environment as Melbourne excursions. Find inspiration for your New Zealand cruise itinerary with these must-visit Auckland attractions. Discover natural beauty on Bay of Islands shore excursions. Fremantle excursions prove that western Australia offers just as much as the more famous east. Prepare to make memories with these New Zealand and Australia cruise tips. You’ll find helpful advice to enhance any itinerary and vacation style. Find things to do in Brisbane, Australia, while you're in port. Wondering what to bring back from your Australia cruise? These 10 Melbourne travel tips from Princess Cruises will help you experience the best of this iconic Australian city as only a local would. Let these three reasons persuade you to make your next vacation a cruise to Australia or New Zealand with Princess Cruises. Settle the Melbourne vs. Sydney debate once and for all with this simple breakdown by Princess Cruises. Discover cultural diversity and unexpected surprises on Auckland shore excursions. Ride camelback along miles of white-sand beaches. Gaze across Australia’s unspoiled, crystal clear waters. 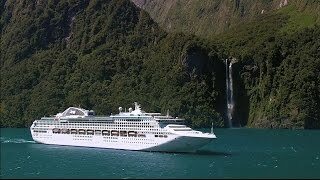 This is only a taste of what you’ll find when you cruise to Australia and New Zealand with Princess. Experience Australia's wild side on Cairns shore excursions. From the Sydney Opera House to Manly Beach, here are five sites you don't want to miss when you next cruise Australia. Exploring the capital of New Zealand on Wellington excursions will offer you gorgeous scenery. Inspire and enhance your itinerary with these seven things to do in The Rocks. These must-try Dunedin and Auckland shore excursions are sure to enhance your itinerary and ignite your sense of adventure. Do as the locals do with local-recommended cruise activities. Experience Australia and New Zealand through tours, enrichment programs and authentic local cuisine. Explore foreign lands when you embark on a Tauranga shore excursions. Be prepared for bucket-list inspiration and immersive adventure when you cruise to Tasmania. You may visit more famous ports on your cruise, but these Fiji excursions will stand out. The Great Barrier Reef, stunning coastlines and relaxed charm are calling. Sail to almost anyplace you can dream of. First time cruising? Have questions? We have the answers so your first time will be nothing but smooth sailing.